Here is another example of why custom cabinets just can’t be beat. 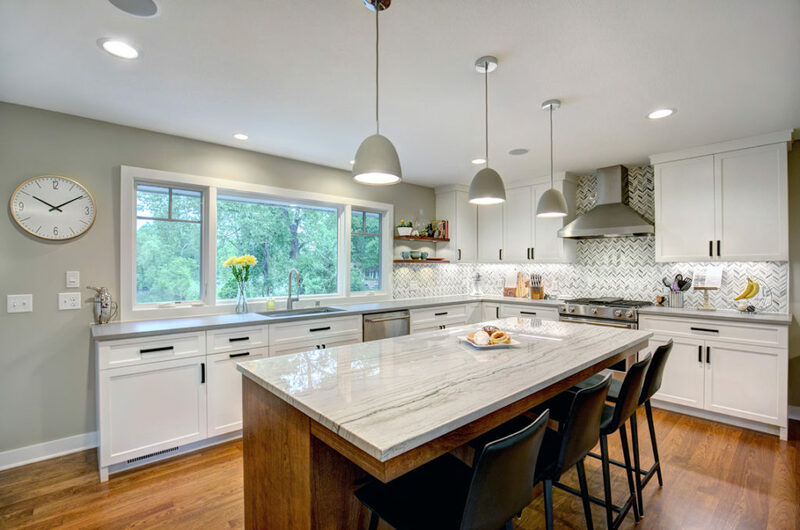 Our sister company, Excel Builders recently completed a custom kitchen remodel in Edina, MN. In the design phase, while working with the clients it was decided that 2 interior walls should be removed, along with a set of steps in the back of the house. This was not only to make the kitchen larger, but also open up to the family room. Removing these walls allowed for plenty of room for additional custom cabinetry to be installed. Storage was the primary concern while designing the cabinetry. 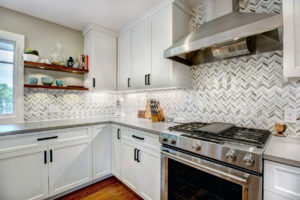 The second goal was to have plenty of prep space for cooking, along with space for entertaining guests. Our custom cabinets were designed, and built specially for the space. On the perimeter of the kitchen we painted the cabinetry in Benjamin Moore Chanitly Lace. Since the kitchen was so open, and we place a 10’ wide window in the center of the exterior wall, we were limited on the amount of upper cabinets we could have, so we extended them to the ceiling making them 40” tall. To make up for the lack of the upper cabinets there was plenty of lower cabinets. In the lower cabinets we installed pullouts, and extra drawers. By doing this, the cabinet space was more efficient and accessible. The island was made was made from Cherry wood solids, and was filled with 9 drawers for plenty of storage. The island was designed to seat 4 people and plenty of prep space… oh, the cookies that could be made here! All of our drawers for the cabinets, we make are made of high quality 5/8” Maple and dove tailed. Full extension and soft close glides are standard with our cabintry. As always, with quality construction and quality hardware, these drawers are built to last for many years to come. Next to the fridge we built a floor to ceiling pantry. Along with the pantry, we built a countertop to ceiling cabinet to house the microwave, toaster and coffee maker to keep the countertops clutter free. As with all the cabinetry, we design first. We work with our clients on a 1 on 1 basis, to ensure you get exactly what you want, and a little something you may never realized you could have! 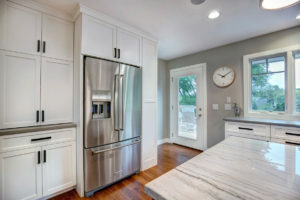 Looking for new cabinetry, give Artisan Cabinet Company a call at 612.235.4873. Get started on your cabinetry design today!